I watched Jimmy Kimmel’s monologue at last night’s White House Correspondents’ Association Dinner in its entirety here. The Hill also reported on the event, including President Obama’s speech. 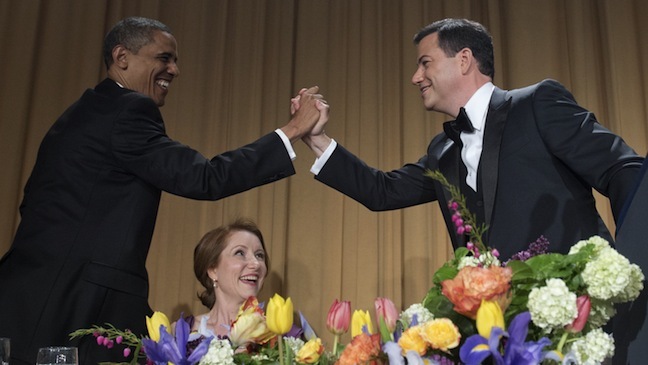 Kimmel was funny in spots, but as is always the case at these events, he saved his really mean jokes for the Republicans. Barbs aimed at Democrats are likely to be flattery in disguise, like Kimmel’s references to Democrats “rolling over” in negotiations with Republicans. The problem with the Dems, the comedians always suggest, is that they aren’t tough enough in standing up to those evil Republicans. To my knowledge, no comedian has ever made a joke the point of which is that the Republicans are too weak in dealing with the evil Democrats.